This year, possibly more than any year, has seen a dramatic shift in the way companies design, manufacture and sell smartphones and tablets. Business models have been increasingly shifted to a service-first model, as device makers attempt to lure customers to their platforms with the promise of value-added services and offering all the media content they could possibly want in one place. In 2012, Apple has gone from strength-to-strength, cementing its position as the biggest technology company in the world, while Google bought Motorola Mobility, seen Android reach hundreds of millions of people around the world and integrated more and more of its apps and services into its mobile offerings. Microsoft has pushed ahead with its Windows 8 and Windows Phone 8 platforms, as it attempts to carve its own path in the tablet and smartphone markets. It’s been a mixed year for HTC, Huawei, Sony (formerly Sony Ericsson) and RIM, but there have been some super smartphones and tablets released – giving us, the customer, more choice than we could possibly imagine. As we come to the end of 2012, we look back to identify the real smartphone and tablet winners. Read on to find out what they are. Possibly the most leaked Apple product of all time, the iPhone 5 easily became the world’s fastest selling smartphone. Unveiled in mid-September and released in nine markets before the end of the month, Apple quickly notched up 2 million sales of the iPhone 5 in its first 24 hours on sale, reaching 5 million in its launch weekend. It saw a similar response when it launched in China, reaching 2 million sales in its opening weekend. The iPhone hasn’t strayed far from the iconic iPhone 4/iPhone 4S design, but it’s the first iPhone to sport a 4-inch display, features the new A6 processor, comes in 18% thinner than its predecessors and is 20 percent lighter at 112 grams. It’s also the first 4G LTE Apple smartphone, although the iPad was previously equipped with LTE radios. Apple also did away with the 30-pin jack for its new Lightning connector, which can be plugged-in without needing to fumble around to get it the right way up. While the company has seen more than its fair share of issues over its new Maps app, we like the iPhone 5’s speedy processor, which promptly loads apps and crunches data. With its bigger screen, you can see more content, enjoy more from videos and, of course, you get an extra row to place your icons. It feels so light in the hand that you often feel like you are going to drop it at any moment – and while it’s scary at first, you really do realise how comfortable in the hand it is when you pick up its older counterparts. It’s been another stellar year for Samsung, which has overtaken Nokia to become not only the world’s biggest smartphone maker, but overtook Nokia to become the world’s most popular mobile phone company (on units sold). A lot of Samsung’s success comes down to its incredibly popular Galaxy smartphone range, which evolved from last year’s bestselling Galaxy S II handset to its bigger and more powerful sibling – the Galaxy S III. Launched in 28 markets in Europe and the Middle East in May, the Galaxy S III quickly reached 10 million sales, taking just over two months to double that figure. By November, the smartphone had blasted past the 30 million mark, and with holiday sales behind it, may not be far from passing its next big milestone. The Galaxy S III sports a stunning 4.8-inch 1280×720 Super AMOLED display, is powered by Samsung’s own 1.4 GHz Exynos 4 quad-core processor and packs in an 8-megapixel camera. However, Samsung made sure to overhaul its TouchWiz UI, introducing a number of impressive new apps and features that mimicked its Cupertino rival, but also gave Android users some novel features not found on iOS and Windows Phone. Samsung’s S-Voice offers a Siri-like voice assistant, while the front-facing camera track your eye movement detect whether you are looking at the device, keeping the screen lit until you look away or no longer use it. With its large and vibrant display, sleek design and powerful processor, the Galaxy S III is the world’s most popular Android device – and while the Galaxy S 4 is said to be coming early next year, Samsung can expect to sell a lot of these smartphones well into 2013. In 2012, Google changed the way it positioned its Nexus line, but didn’t change the way sold the devices. This left customers unaware of order statuses or an idea of when they could get their hands on one of them. Before all that, The Next Web scooped Google’s Nexus launch, correctly reporting that the company would launch a new LG-made Nexus 4, updated Nexus 7 and Samsung-made Nexus 10. The event itself was eventually cancelled as Hurricane Sandy reeked havoc across the east coast of the US. Making the Nexus 4 available to all with an insanely low price tag of $299 for the 8GB model and $349 for the 16GB model, Google’s Play Store was swamped with customers looking to get their hands on the powerful and sleek LG smartphone. While LG and Google continue to try and overcome their struggles to keep up with demand and keep customers happy, those that have received their handset have loved it. Featuring a quad-core 1.5 GHz Qualcomm APQ8064 Snapdragon processor, 4.7-inch 1280 x 768 display, 2GB RAM, an 8-megapixel rear-facing camera and a 2100mAh battery, the Nexus 4 is the first device to run Google’s latest Android firmware — Android 4.2 — which adds a new swipeable keyboard, lock screen widgets, screensavers, accessibility improvements and improved notifications. front and center. The fact that the Nexus 4 looks great doesn’t hurt either. Nokia finally got the chance to launch its new Lumia Windows Phone 8 handsets in November, putting an end to months of waiting for the chance to offer improved hardware and software features with its new Lumia 920 and Lumia 820 handsets. Nokia’s flagship smartphone continues the company’s polycarbonate design trend, with a focus on optics and display technology. Inside, there’s a dual-core 1.5GHz Snapdragon S4 processor, complete with 1GB of RAM but Nokia is proud of its 4.5-inch IPS LCD display, which it says utilises its new ‘PureMotion HD+’ technology that has Synaptics tech that allows users to swipe and press even with thick gloves on. The Lumia 920’s camera is exceptionally good, including a f/2.0 8.7-megapixel sensor, but the magic is in its optical image stabilisation and low-light sensitivity. The optical image stabilisation features are seriously good on the Lumia 920, with Nokia able to reduce the amount of shake thanks to its “floating lens” technology, which suspends the Lumia 920′s optics and stabilises it using springs. Allowing the lens to move at one with the device keeps the optics steady, ensuring that videos are less shaky and allowing more light to enter the assembly in low light conditions. In our review we said that the Lumia 920 edges out HTC’s 8X, because of the features listed above. The phone really is innovative, but its weight might be a deal breaker for some. Struggling with a collections of low cost, mid-range and high-end smartphones, HTC overhauled its mobile strategy and came back with its new One range of Android devices. In April, HTC unveiled the One X, introducing a slightly-curved polycarbonate unibody design with a soft touch back that included a 4.7-inch Super LCD 1280 x 720 display, a 1.5GHz quad-core Tegra 3 processor, 1GB of RAM and 32GB of in-built storage. In our review, we remarked how well HTC had done to revert back to basics and focus on features instead of pushing hardware specifications, tightly integrating display, camera and a powerful processor with it revamped Sense UI. Six month after the launch of the One X, HTC decided that instead of going back to the drawing board and outputting a new design, it would stick with the One X form and update its internals, evolving its flagship to launch the HTC One X+. The One X+ has the same 4.7-inch Super LCD 2 1280 x 720 display and matches its predecessor with 1GB of RAM, but inside the One X+’s processor was been given a slight boost, featuring a 1.7 GHz quad-core Tegra 3 chip, which HTC says makes the One X+ “up to 67 percent faster” than the One X LTE. While the One X+ wasn’t something a One X owner would buy, it is definitely a very impressive smartphone in its own right. HTC got it right with design and continues to take its own path when it comes to software improvements, but unfortunately that hasn’t equated to sales. 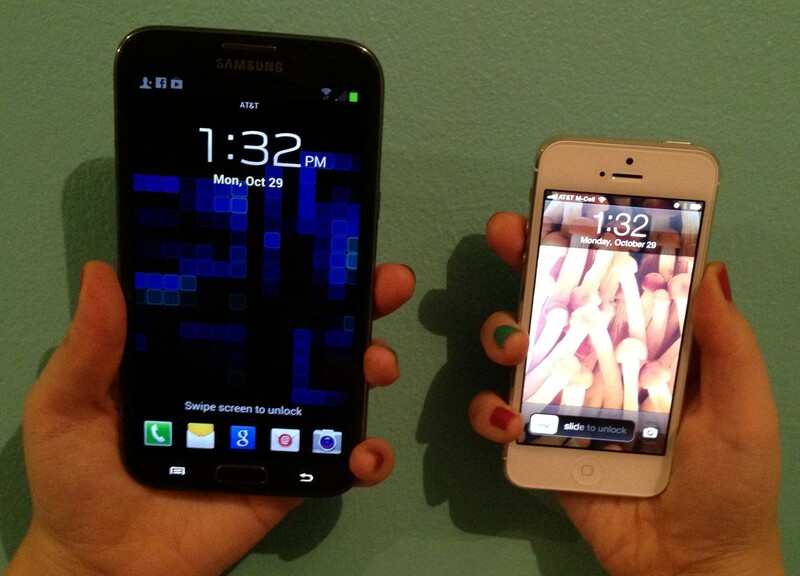 If Samsung’s Galaxy S III wasn’t dominating the headlines, the Galaxy Note II was holding a few of its own. The Galaxy Note II was unveiled on August 29, launching with a 5.5-inch Super AMOLED Plus display, quad-core 1.6 GHz Cortex-A9 CPU, 2GB of RAM and an incredible 3100 mAh battery. Since its release, the Galaxy Note 2 raced to 3 million channel sales in just 37 days, adding a further 2 million 24 days later. While the Galaxy S III is on track to blast past the 50 million sales mark in early 2013, Samsung forecasts that the Galaxy Note 2 will sell 20 million until alone, which would double that of its predecessor. Recognising the different use cases of the Galaxy Note II, Samsung developed a number of software features that work perfectly with the S-Pen, allowing users to annotate, draw, edit and share pretty much anything they want. With it’s large display, Samsung developed new ways for apps to share screen real estate and allow people to get the most out of their video content. The 3,100 mAh battery also ensures that the Galaxy Note II can run for an incredibly long time. While many modern Android devices often drop a full charge in under 24 hours of use, the Galaxy Note II often doubles that and makes it a perfect smartphone for work and play. While it didn’t make the list, TNW writers have also been impressed by HTC’s 8X, which features a unique curved design that was initially modelled on a shoe. We loved its powerful hardware and stunning display, which made it the perfect device for Microsoft to showcase in its TV advertising campaigns. However, we did feel that HTC’s button placements (most notably the power button) and lack of overall ecosystem let it down when compared to the Lumia 920. Other notable smartphones include the HTC Droid DNA, the Optimus G and Sony Xperia T.
So, that’s our list – one that will divide opinion. What would you add? What would you drop? Let us know in the comments.